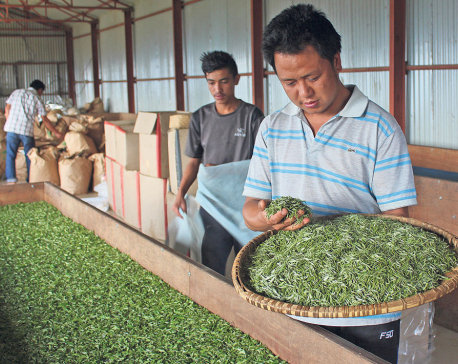 ILAM, July 25: Tea producers in Ilam are facing difficulties in meeting the demand from international buyers Although the district is famous for tea production, it has not been able to produce sufficient tea to fulfill demand in the international market. There is a high demand for Nepali orthodox tea in the international market. Orthodox tea not only tastes good, but is also beneficial for health and environment as well, farmers say. This is why the demand for orthodox tea is high in the international market. 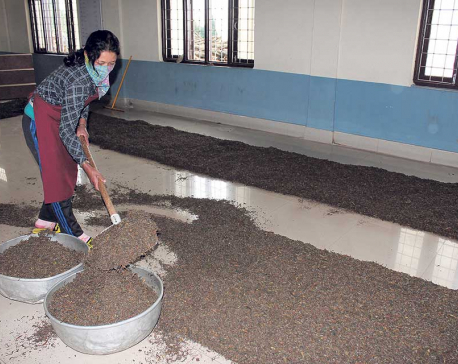 Milan Kumari Khatri, the owner of Sakhejung-based Kanchenjanga Organic Tea Processing Industry, said that she received an order for 900,000 kilograms of tea from a Europe-based buyer before tea plucking season had even begun. But she couldn’t take the order as the annual production capacity of her industry is around 200,000 kilograms only. Maipokhari Organic Tea Processing Industry of Jasbire also faced similar situation. Sharad Subba, owner of the industry, said that he received orders for more than 200,000 kilograms of organic tea from the Netherlands, China, Japan and Russia. However, he couldn’t accept the order as production capacity of his plant is only around 5,000 kilograms per year. Both these plants have not received organic certification yet. Despite this, demand for their product is increasing with each passing year. However, both the plants are in the process of getting organic certification. Earlier in April, 17 tea traders from nine countries visited Suryodaya Municipality and offered to buy all productions of local organic tea farmers. Rana Bahadur Rai, the mayor of Suryodaya Municipality said, a huge crowd of international buyers visit Ilam every year to meet farmers producing organic tea. “However, local farmers are being unable to produce tea as per the demand,” he rued. There are 131 tea industries in 14 districts of the country. According to statistics prepared by Central Bureau of Statistics and Nepal Tea & Coffee Development Board, these industries produce around 19 million kilograms of tea annually. Only about 11 percent of the total production is organic tea. Around 30 percent of tea gardens in these districts are in the process of getting organic certification. Gorkha Tea State of Sundarpani in Suryodaya Municipality, Himalayan Shangrila Tea Producers Pvt Ltd of Sakhejung, Kanchenjunga Tea State of Panchthar and Guranse Tea Processing Industry of Dhankuta are the big organic tea producers in the country. Himalayan Shangrila Tea Producers produces 120,000 kilograms of organic tea annually. Gorkha Tea State and Kanchenjunga Tea State produce 68,000 and 50,000 kilograms of organic tea annually. 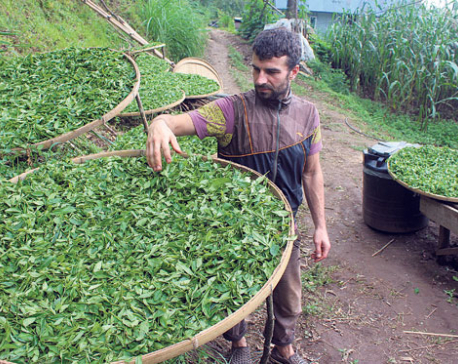 Small-scale farms also produce high-quality organic tea. Of the seven privatized state-owned tea gardens in Jhapa and Ilam, gardens in Ilam produce 5,000 kilograms of organic tea annually. Udaya Chapagain, owner of Gorkha Tea State, single efforts by industrialists alone cannot improve tea production. “The government has not played its part to increase production, and promotion and marketing of organic tea in the international market,” he added. Two years ago, Indian traders, who buy 95 percent of total tea production in Nepal, had warned Nepali industrialists that they won’t buy tea produced with traditional farming system. This forced many industries in the area to go for organic certification. 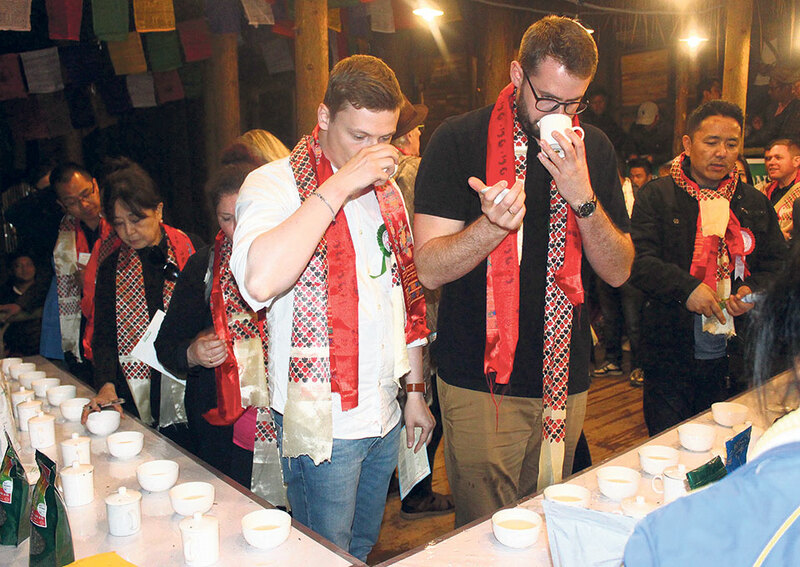 Out of around 5.5 million kilograms of orthodox tea being produced annually in the hilly region, only 300,000 kilograms are organic tea, according to Himalayan Orthodox Tea Producers Association (HOTPA). Germany is the main buyer of Nepali organic tea. “Nepal is one of the major suppliers of organic tea in the international market,” according to Chapagain. As organic certification process takes as long as three years, many farmers do not want to go through the cumbersome and lengthy process. Specialty, black white, green and Oolong are the major tea varieties grown in Nepal.